This is my version of the Jane Austen quilt from my UFO pile, and it's on my design wall this morning. I pieced this quilt several years ago,and I've learned a lot about measuring for borders and how to correctly put them on a quilt since then. I think I'm going to take the border off, remeasure the quilt, and put a wider border on. What do you think? Another green border but a bit wider? Maybe a thinner red inner border? The 60 degree diamonds in this quilt are mirror imaged both top to bottom and left to right just as Jane Austen did in her quilt. This quilt is a replica of what Jane Austen and her sister, Cassandra, and their Mother made sometime around 1812. Sense and Sensibility was published toward the end of 1811, and Pride and Prejudice was published in early 1813. I have the BBC movie version of Pride and Prejudice with Colin Firth as Mr. Darcy. It is 4 or 5 hours long, but I never get tired of watching. Here is a photo of the original Jane Austen quilt that hangs in the Jane Austen House Museum in Chawton Village, Hampshire, England. Jane, Cassandra, and their Mother lived there from about 1809 until mid 1817. Jane died on July 18, 1817. The original coverlet measures 97 X 105 inches, and it is not quilted. This photograph is on a postcard sent to me by Linda Franz in 2001 when she visitied England after she had toured the Museum. Stop by Linda's web site to see her book, The Jane Austen Patchwork Mystery. 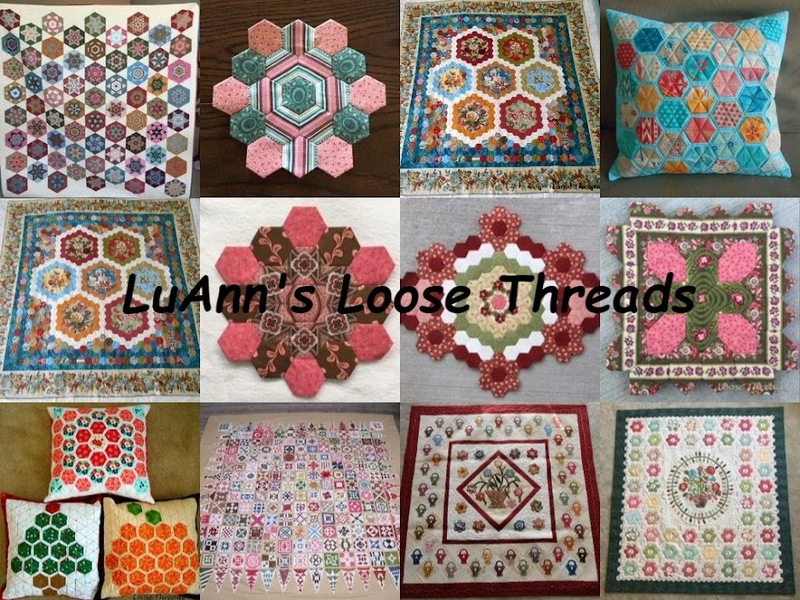 Her book Quilted Diamonds is based on a combination of this quilt, the Dear Jane quilt, and Linda's love of all things Jane Austen. Design Wall Monday is hosted by Judy Laquidara. I hope all of you have something on your design walls today, and that you are busy stitching. Welcome to my new followers. Thanks everyone for stopping by for a visit. I spent Tuesday morning looking for something in my sewing room, and I made such a mess that I had to spend most of Wednesday and some time on Thursday putting it all back together again. In between bouts of cleaning and straightening, I sewed these two hexagon flowers. Thank you Karen at Journey of a Quilter for hosting One Flower Wednesday. And, I also made this mug rug. The little 9 patches finish at 1 1/2" inches and are left over from a quilt I made last year. The flower was part of the cheater cloth that was included in the Fresh Flowers fat quarter pack that I ordered. This mug rug was machine quilted. We had more snow overnight. It doesn't look like much, but there was freezing rain and sleet underneath it. I shoveled the driveway today (about 75 feet X two cars wide) because I knew the snow was too heavy and wet to use the snowblower. In fact, the snow was so wet that it just rolled up when i shoveled it, so I made a snowman. The photo isn't very clear, but I think if I went back out and decorated him, he would look like Snoopy. I sent the photo to my daughter, and she thought it looked like Gandalph from Lord of the Rings. Either way, the neighbors are probably calling the Neighborhood Watch block captain to keep an eye on me. I hope you found some time to stitch today. I'll stitch tomorrow while I'm recuperating from shoveling. Thanks for visiting! My daughter was home for a visit this weekend, and we had talked about making cupcakes off and on since Thursday evening. Somehow we were always too tired or too busy or whatever to make them. Well, she had to leave this evening so I decided today had to be the day. I made these cupcakes before breakfast. I know most people don't have dessert after breakfast, but today we decided to make an exception and have a cupcake. The quilt in this photo is one of my UFOs. I made it to go on this dining room table and plan to hand quilt it. What you can't see too well in this photo is that I've only appliqued the flowers and leaves on one side of the border. Actually seeing it on the table may be enough motivation for me to finish it. ﻿Here's a little closer look at the border that I do have finished. The cupcakes that we made are from my husband's favorite chocolate cake recipe. His Mom gave it to me many, many years ago. I'll share it with you. I hope you all have some time to stitch today.....and to eat a cupcake!!!!!! I'm a little late to the mug rug craze, but since today is One Flower Wednesday over at Karen's blog, Journey of a Quilter, I decided to use my flower on a mug rug. And, since I've been making string blocks and can't seem to get enough of them, I decided to combine the two. I finally cut into my Fresh Flowers fat quarter stack that you saw a couple of posts ago. I really love these fabrics. You may think this is a bit over the top, but I was in the mood to hand quilt something. I have a lot of quilt tops. OK, let's be honest; I have a clothes basket heaped full of unquilted tops. I didn't have anything basted, so I hand quilted this little mug rug. It has been a long time since I have hand quilted anything, and it was really enjoyable. These are my two thimbles of choice. The thimble on the left is my Thimblelady Thimble by Liuxin Newman. The thimble on the right is my Tommie Lane Thimble. This one is special because Tommie herself fit this thimble on me at the NQA Quilt Show over in Columbus, Ohio, several years ago. I really can't decide which one I prefer. I think the Thimblelady thimble is more comfortable, but I like the way both of them stitch....so I just switch from one to the other. I hope all of you are finding some time to do some stitching today!!!!! This is my finished Valentine quilt top that I made out of my red and neutral scraps for the Rainbow Scrap Challenge hosted by So Scrappy Blog. These string blocks are really addictive and quick to make. I chain piece them through my machine and before long there is enough for a quilt top. Happy Valentine's Day to all of you that stop by my blog for a visit. New Fabrics...I had to do it!!!! I had to order some new fabric. I really did! I've been on a fabric diet since the new year. And, I'd been very good about not shopping, but I just had to buy this fat quarter pack. I'm in a round robin and I found some fabrics here and made my center which I can't show you because we keep our centers a secret until we get our quilts back in November. We send some fabrics along with our center, but when I went to my stash to find the fabrics that went with my center, I realized that I had cut them all up into squares to make hexagons and strips to make scrap quilts. So, you see...I really did have to order this. It's the Fresh Flowers line by Deb Strain for Moda. While looking through my UFOs I found my notebook of Elegant Garden patterns by Edyta Sitar. Here is one of the applique' blocks that I've finished. I hope you are finding some time today for stitching. Thanks for stopping by for a visit! Today is scrappy Saturday over at SoScrappy blog. The color Angela chose for the February challenge is red. 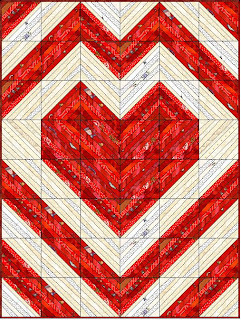 Since Valentine's Day is this month, I designed this quilt in Electric Quilt. There isn't a string block in the block library, so I drew one. I sorted my red and neutral scraps. My scraps are sorted mostly by strip width instead of color so it took awhile to go through all of my scraps. I made a few string blocks today. I normally draw a line down the center of the foundation paper before I start to sew, but there really is no need to do that because you can just place your ruler down the center of the block between the colors if you are doing a two color block. I trimmed these to 8 1/2". I still have 32 blocks to sew, but here is what the quilt looks like on my design wall so far. These string blocks are pretty addictive. I chain pieced them through my machine this afternoon while watching a movie. We had 3 or 4 inches of snow today on top of the ice coating that is still covering everything. We really didn't need any more winter weather, but it did look pretty coming down. Hope you all had some time to take a few stitches today. Thanks for stopping by for a visit. 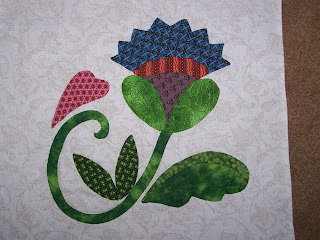 This is my hexagon flower for One Flower Wednesday over on Karen's blog, Journey of a Quilter. I've been working on Roll Roll Cotton Boll trying to get the top finished so there is only one flower for today. I was busy over the weekend working on my center for this year's round robin. I'm working with the same group of girls that were in our group last year. This is my quilt from last year, and I'm really thrilled with it. Here are photos from today. I took these standing in the garage.....not on the ice. The bushes are so pretty all coated with ice. We have a lot of smaller limbs down, but luckily we didn't lose power at all during the storm. This was a chunk of ice that my husband chipped off right outside of our garage doors. This one is an inch and a half thick. We had sleet, freezing rain, and then it melted and refroze. A lot slid off of the roof, and there is a build-up in front of our garage doors that we are going to try to chip away tomorrow. Then we can put sand or kitty litter on the sloped part of the driveway so we can get some traction as we try and back out. Me? Well, I have fabric, yarn, chocolate, and coffee....so I'm just fine here until it melts. Hope you all are finding some time to do some stitching. I know I will!